For the latest, see Ace's blog, here. 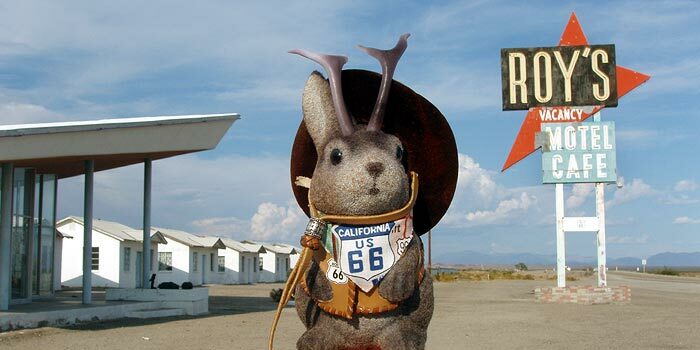 These are the travels of Ace Jackalope - adventurer, cultural investigator and 'lope-about-town. Here's a newly revamped prologue and a partial index of posts. Google seems to like us, so if there is something you are looking for, just google "thelope.com" and the topic. If you found us through Brian Butko's book, Roadside Attractions: Cool Cafés, Souvenir Stands, Route 66 Relics, & Other Road Trip Fun , you'll find plenty of roadside attractions and architecture here. If you came here from NPR, CNN, CNN.com, The Washington Post, The Atlanta Constitution Journal or Land Line Magazine looking for Greensburg photos, go to the top of our index of posts and you'll see a list. Though this is otherwise a travel blog, you might enjoy seeing Ace lead chocolate bunnies and peeps in rebellion in Lope of the Peeps.